While looking around blogland today, I found several sweet chick recipes that would be a fun addition to your Easter week menu. If you are in the mood for a "chick sandwich" check out Cute Food for Kids and her super cute ham and cheese here. 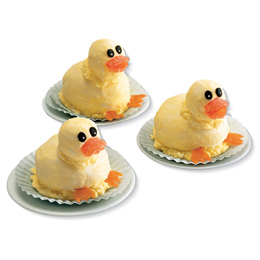 These darling ducks are made from ice cream and gum drops, you can see the recipe here on Familyfun.com. Also on FamilyFun.com you can see how a video how-to for these sweety birds. You can find the recipe for these Peep chick in nest cupcake here on Food.com. 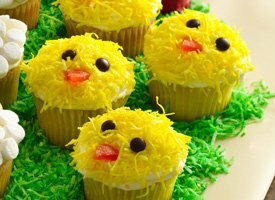 Here is another really cute version of a chick cupcake on BettyCrocker.com. 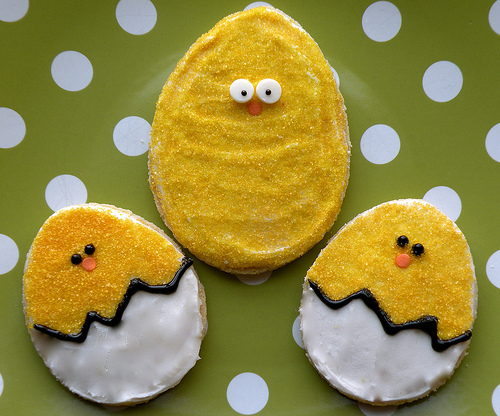 If you prefer cookies, how about these chick sugar cookies from MrsFieldsSecrets.